Mouse anti DAZL antibody, clone 3/11A (MCA2336) used for the detection of DAZL expressing cells in fetal human overy by immunofluorescence on formalin fixed, paraffin embedded tissue sections. Co-localisation of GDF9 with activin βA but not DAZL or BOLL prior to follicle formation. 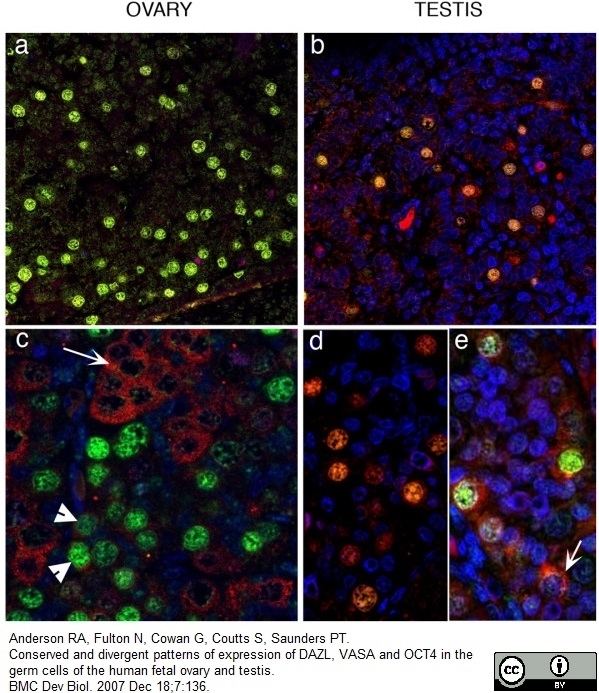 (A) Double immunohistochemistry of 18 week fetal ovary stained for GDF9 (green) and activin βA (red), thus in the merged image co-expression is yellow. Unstained germ cells are indicated with arrows. Counterstain is TOPRO. (B) Triple fluorescent immunohistochemistry for GDF9 (green), DAZL (blue) and BOLL (red) in 20 week human fetal ovary with DAPI as counterstain (grey). Split channel and merged images in (A) and (B) are shown as are merged images of non-immune serum negative control (NEG). Scale bars are 20μm. (C) Nuclear diameters of DAZL, BOLL and GDF9 stained germ cells indicates that GDF9 positive cells are significantly larger (p<0.001) than DAZL but not BOLL expressing cells (bars indicate mean ± sem). (D) Higher magnification merged image of GDF9/DAZL/BOLL immunohistochemistry showing one large primordial follicle is positive for both GDF9 and DAZL but other follicles are positive only for DAZL. GDF9 is Transiently Expressed in Oocytes before Follicle Formation in the Human Fetal Ovary and is Regulated by a Novel NOBOX Transcript. Mouse anti Human DAZL antibody, clone 3/11A (MCA2336) used for the detection of DAZL in ovarian and testicular tissue lysates by western blotting. Western analysis of 1st and 2nd trimester ovaries and testes. In both ovarian (A) and testicular (B) samples VASA (76 kDa) was not detectable in the 1st trimester samples but was present in those from the 2nd trimester. DAZL (33 kDa) was low/undetectable in 1st trimester ovaries (C) whereas it was detectable in ovarian samples from 2nd trimester and testicular samples from both 1st and 2nd trimester (D). OCT4 (42 kDa) was present in both ovaries (E) and testes (F) during both the 1st and 2nd trimester. The loading control in all cases was β-tubulin (51 kDa). From: Anderson RA, Fulton N, Cowan G, Coutts S, Saunders PT. 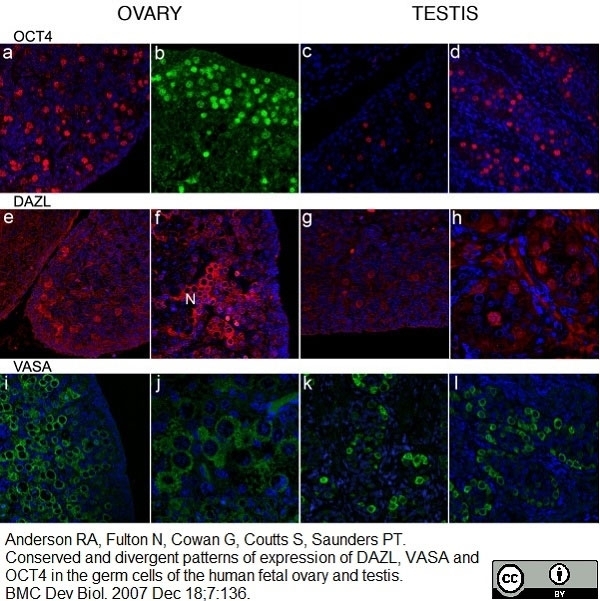 Conserved and divergent patterns of expression of DAZL, VASA and OCT4 in the germ cells of the human fetal ovary and testis. BMC Dev Biol. 2007 Dec 18;7:136. Mouse anti Human DAZL antibody, clone 3/11A (MCA2336) used for the detection of DAZL expressing cells in ovarian tissue by immunofluorescence. Immunoexpression of OCT4, DAZL and VASA. OCT4 positive germ cell nuclei were detectable in both the 1st and 2nd trimester ovaries (a, 62 d; b, 16 wk) and testes (c, 64 d; d, 16 wk). DAZL positive germ cells were rare in the 1st trimester (e, ovary 61 d; g, testis 64 d) but groups of cells ('nests', labelled N) with cytoplasmic staining were present in the 2nd trimester ovaries (f, 20 wk). During the 2nd trimester VASA protein was detected in the cytoplasm of female germ cells (i, 14 wk; j, 18 wk) throughout the ovary with the exception of the sub-epithelial layer. In the testes (k, 15 wk; l, 16 wk) VASA-positive germ cells were found in all cords. Co-localisation of OCT4 and DAZL. In 1st trimester ovaries (a, 61 d) and testes (b, 64 d) OCT4 (green) and DAZL (red) were co-localised to germ cell nuclei. In ovaries from the 2nd trimester (c, 14 wk) DAZL protein was almost exclusively cytoplasmic and was largely localised to OCT4 negative groups of cells (arrow); a few OCT4 positive cells had a low level of DAZL immunoexpression in their cytoplasm (arrowheads). Testes, panel b, 64 d; panel d, 16 wk; panel e, 19 wk gestation. In 2nd trimester testes (d, 16 wk; e, 19 wk) DAZL was still expressed in the nuclei of some OCT4 positive germ cells but this pattern of expression was variable with DAZL protein present in the cytoplasm of OCT4 positive and OCT4 negative (arrow panel e) cells.Co-localisation of OCT4 and DAZL. In 1st trimester ovaries (a, 61 d) and testes (b, 64 d) OCT4 (green) and DAZL (red) were co-localised to germ cell nuclei. In ovaries from the 2nd trimester (c, 14 wk) DAZL protein was almost exclusively cytoplasmic and was largely localised to OCT4 negative groups of cells (arrow); a few OCT4 positive cells had a low level of DAZL immunoexpression in their cytoplasm (arrowheads). Testes, panel b, 64 d; panel d, 16 wk; panel e, 19 wk gestation. In 2nd trimester testes (d, 16 wk; e, 19 wk) DAZL was still expressed in the nuclei of some OCT4 positive germ cells but this pattern of expression was variable with DAZL protein present in the cytoplasm of OCT4 positive and OCT4 negative (arrow panel e) cells. Mouse anti Human DAZL antibody, clone 3/11A (MCA2336) used for the detection of DAZL expressing cells in cynomolgus monkey testes by immunofluorescence on formalin fixed cryosections. Morphological features of cynomolgus monkey testes, and expression of VASA protein. (A–C) Sections of testes of 3-year-old (A) and 5-year-old monkeys (B,C) were stained with hematoxylin and eosin. Sg, spermatogonium; P, pachytene spermatocyte; Sd, spermatid. 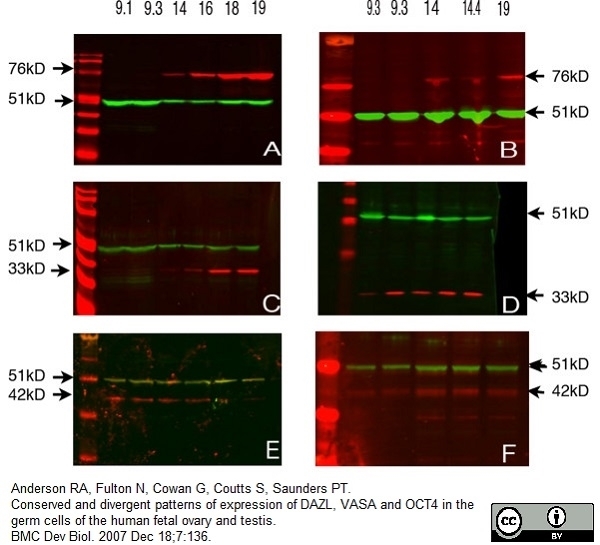 (D–Q) Expression of VASA, DAZL, and SCP1 proteins during spermatogenesis in cynomolgus monkeys. Sections of 3-year-old (D,E) and 5-year old testes (F–Q) were examined by immunostaining. The nuclei were stained with Hoechst 33258. Merged images were also shown (E; VASA, red; Hoechst, white), (H, I; VASA, red; DAZL, green; Hoechst, white), (L,M; VASA, red; SCP1, green; Hoechst, white), (P,Q; DAZL, red; SCP1, green; Hoechst, white). VASA expression was observed in spermatogonia in the 3-year-old testis (E, red), and in spermatogonia (open arrowhead), spermatocytes (arrow), and early spermatids (arrowhead) in the 5-year-old testis (I, M, red). The expression of VASA, DAZL, and SCP1 proteins was all detected in spermatocytes (arrow; I, M, Q). The dotted lines indicate the basement membranes of the seminiferous tubules. The scale bar is 25 μm. 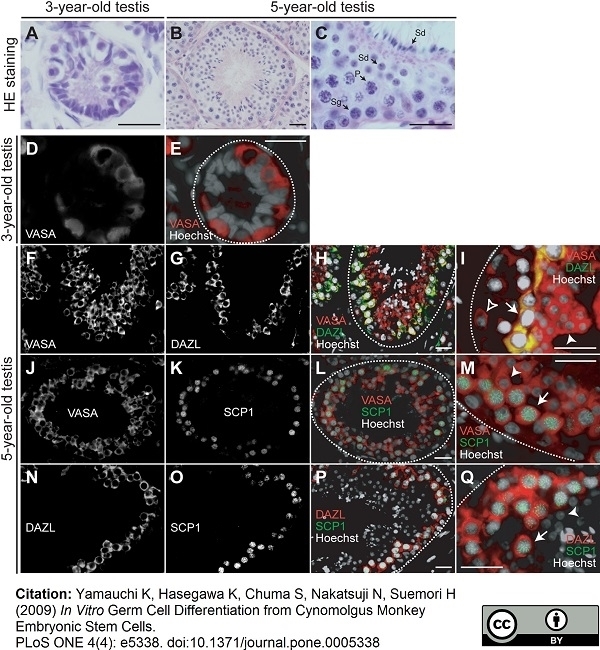 In Vitro Germ Cell Differentiation from Cynomolgus Monkey Embryonic Stem Cells. Mouse anti Human DAZL antibody, clone 3/11A (MCA2336) used for the detection of DAZL expressing cells in rat testis by immunohistochemistry on formalin fixed, paraffin embedded tissue sections. Immunohistochemistry showing localisation of germ cells and 5mC during mid to late gestation. 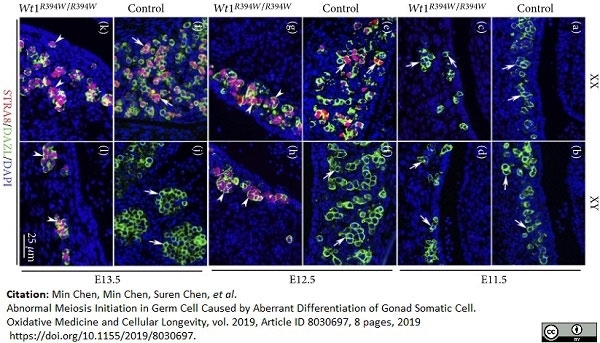 In order to clearly show the localisation of germ cells at all stages of development, we used the specific germ cell cytoplasmic marker DAZL, which survives acid denaturation, in combination with 5mC for immunohistochemistry. The cytoplasm of germ cells is stained for DAZL in blue and 5mC is indicated by brown staining in nuclei. Germ cells (indicated by yellow arrows) are located within seminiferous cords which are surrounded by somatic cells; one seminiferous cord is shown outlined in each image. There are also somatic cells within the seminiferous cords (green arrows). 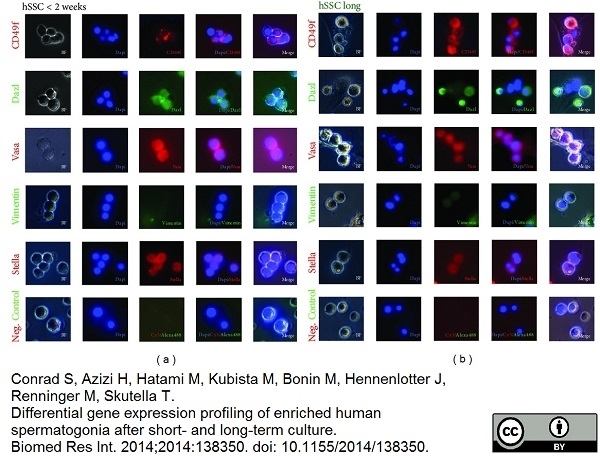 Images show that 5mC is undetectable in germ cells between e14.5 and e18.5 (A to E). 5mC is detectable in germ cells at e19.5 (F, indicated by red arrow) and is more marked in germ cells at e20.5 and e21.5 (G, H). 5mC is present in somatic cells throughout the time course. Scale bar = 50 μm. From: Rose CM, van den Driesche S, Sharpe RM, Meehan RR, Drake AJ. Epigenetics Chromatin. 2014 Aug 7;7:19. From: Chen SR, Zheng QS, Zhang Y, Gao F, Liu YX. Disruption of genital ridge development causes aberrant primordial germ cell proliferation but does not affect their directional migration. BMC Biol. 2013 Mar 5;11:22. The PGCs identity was not changed in Wt1R394W/R394W embryos. PGCs identity was examined by double staining of Stella (red) with PGCs characteristic markers, including Oct4 (A), Dazl (B), SSEA-1 (C), and Blimp1 (D). In Wt1R394W/R394W embryos, PGCs still expressed Stella, SSEA-1, Blimp1, Dazl and pluripotent marker Oct4. Scale bars: 50 μm. PGCs-PGCs interactions, such as E-cadherin and β-catenin were maintained in Wt1R394W/R394W embryos (E, F). Scale bars: 50 μm. The mRNA level of PGCs characteristic markers (Oct4, Dazl, SSEA-1, Blimp1, Nanos2, Figla), and PGCs-PGCs interaction markers (E-cadherin and β-catenin) were detected by real-time RT-PCR, and normalized against PGC-specific marker Stella (G). Each bar, mean ± SD of n = 3 experiments. Immunohistochemical analysis of (a) hSSC < 2 weeks.Cells were stained with CD49f, DAZL, VASA, VIMENTIN, and STELLA. For VIMENTIN the cultures were negative. Magnification 20x. BioMed Research International, vol. 2014, Article ID 138350, 17 pages, 2014. Mouse anti Human DAZL antibody, clone 3/11A recognizes human Deleted in azoospermia-like, also known as DAZL, DAZ homolog, DAZ-like autosomal, Deleted in azoospermia-like 1 or SPGY-like-autosomal. DAZL is a 295 amino acid ~33 kDa member of the DAZ (deleted in azoospermia) family of RNA binding proteins. DAZL is expressed in fetal and adult testes and ovaries, and is believed to play a role in germ cell development. In adult germ cells, the expression of DAZL is predominantly localized to the cytoplasm. Synthetic peptide corresponding to sequence within the C terminal domain of human DAZL (CRVHHFRRSRAMLKSV). Spleen cells from immunised T/O outbred mice were fused with cells of the SP2/0 myeloma cell line. Forand, A. & Bernardino-Sgherri, J. (2009) A critical role of PUMA in maintenance of genomic integrity of murine spermatogonial stem cell precursors after genotoxic stress. Elkin, N.D. (2010) Toxicant-induced leakage of germ cell-specific proteins from seminiferous tubules in the rat: relationship to blood-testis barrier integrity and prospects for biomonitoring. Barrios, F. et al. (2010) Opposing effects of retinoic acid and FGF9 on Nanos2 expression and meiotic entry of mouse germ cells. J Cell Sci. 123: 871-80. Forand, A. et al. (2009) Similarities and differences in the in vivo response of mouse neonatal gonocytes and spermatogonia to genotoxic stress. Anderson, R.A. et al. (2007) Conserved and divergent patterns of expression of DAZL, VASA and OCT4 in the germ cells of the human fetal ovary and testis. BMC Dev Biol. 7: 136. Aoki, T. and Takada, T. (2012) Bisphenol A modulates germ cell differentiation and retinoic acid signaling in mouse ES cells. Yamauchi K et al. (2009) In vitro germ cell differentiation from cynomolgus monkey embryonic stem cells. PLoS One. 4 (4): e5338. Zogbi, C. et al. (2012) Gonocyte development in rats: proliferation, distribution and death revisited. Histochem Cell Biol. 138 (2): 305-22. Woods DC et al. (2013) Embryonic stem cell-derived granulosa cells participate in ovarian follicle formation in vitro and in vivo. Reprod Sci. 20 (5): 524-35. Rose CM et al. (2014) Dynamic changes in DNA modification states during late gestation male germ line development in the rat. Chen SR et al. (2013) Disruption of genital ridge development causes aberrant primordial germ cell proliferation but does not affect their directional migration. Jobling MS et al. (2011) Effects of di(n-butyl) phthalate exposure on foetal rat germ-cell number and differentiation: identification of age-specific windows of vulnerability. Int J Androl. 34 (5 Pt 2): e386-96. Tian-Zhong, M. et al. (2016) Critical role of Emx2 in the pluripotency - differentiation transition in male gonocytes via regulation of FGF9/NODAL pathway. Conrad, S. et al. (2014) Differential gene expression profiling of enriched human spermatogonia after short- and long-term culture. Biomed Res Int. 2014: 138350. Wang Y et al. (2015) Protein Arginine Methyltransferase 5 (Prmt5) Is Required for Germ Cell Survival During Mouse Embryonic Development. Bayne RA et al. (2015) GDF9 is Transiently Expressed in Oocytes before Follicle Formation in the Human Fetal Ovary and is Regulated by a Novel NOBOX Transcript. PLoS One. 10 (3): e0119819. Endo, T. et al. 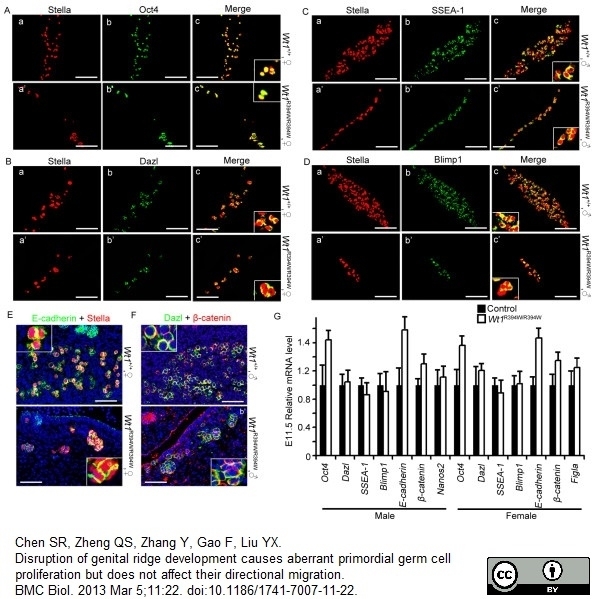 (2015) Periodic retinoic acid-STRA8 signaling intersects with periodic germ-cell competencies to regulate spermatogenesis. Proc Natl Acad Sci U S A. 112 (18): E2347-56.